I recently started making my own dinner rolls again. I stopped making them at some point during my last pregnancy and now it’s been so long since I’ve made them that I almost forgot how easy it is. 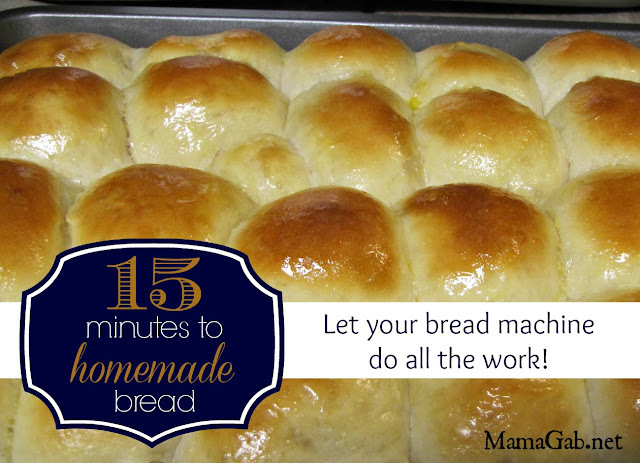 I started timing myself recently to see just how time consuming it is to have homemade dinner rolls. Step 1: Dump ingredients into bread machine. This takes 5 minutes. My instructions say to put dry ingredients in first. Step 2: Put it on the dough setting. Press START. I know, this is hard work, isn’t it? Step 3: Form bread rolls. This takes 10 minutes. Someone taught me this great technique that takes very little time. It’s similar to this video. You can always roll them in your hands instead, just like rolling meatballs, but this method is much faster, once you master it, and they look nicer too. Step 4: Spray a sheet of plastic wrap with cooking spray. Cover rolls and let them rise. This can take an hour or two, depending on how warm your kitchen is. Step 5: Bake for 10-12 minutes. Brush with butter or margarine if you want. *I prefer butter because I believe that real food is always better for your body than synthetic junk. And butter tastes better. Step 6: Eat. A pan this size lasts us for at least 2 meals. The kids love my rolls. I think it’s one of those dishes that my kids will beg me to make when they come home from college. Andrew is a bread snob, but he’ll eat my rolls and Hawaiian bread. That’s about it. Here’s the recipe, which I got from a friend, Leslie A. Make dough in bread machine. Divide dough into 15 or 18 pieces, depending on the size of roll you like. Shape each into a ball. Place in greased baking pan. Cover with plastic wrap coated with cooking oil or spray, let rise 40 minutes or until doubled. Bake in preheated oven at 375 for 12-15 minutes. Brush tops with butter or margarine if desired. *If you’re curious about using a bread machine, check out Jessica Fisher’s article on Why I Love My Bread Machine. I couldn’t say it better myself. **If you want to get a bread machine, scope out garage sales and estate sales. I’m not big on getting up early to go garage sale-ing, but I did manage to score a machine for $15 at an estate sale down the street. And I didn’t even have to wake up early for it. Just watching this makes me miss my bread maker. I need to try making dinner rolls. I used to make so much with it, because it saved so much time. Either way, I know bread doesn’t last long in my home–maybe 1 meal with these bread munchers that I have. Dropping by from the Pint it Party from Beauty Through Imperfection. Yummy! My hubby was looking over my shoulder saying “you should make that”, lol! Wanted to stop by and pin to my bread board 🙂 Thanks for doing the recipe swap with me today! Oh wow…these look delicious!! Pinning and definitely will try! These look delicious!! A few months ago I asked my FB friends if anyone local had a bread machine they wanted to donate to a worthy cause – me. Turned out a friend was holding on to a bread machine that a friend had given her. I’ve since learned why the original owner wasn’t using it. The results are inconsistent at best. It’s a shame because I loved my old bread machine. I’m pinning this post in hopes that I find a better machine soon! Thanks for sharing via Family Fun Friday. What a bummer about your machine! I’m completely in love with mine, though I hear the cheap $30 bread machines are much faster than mine, so it might be worth it for me to get a new one. The dough cycle takes 2 1/2 hours! I hope you score a bread machine soon. Yum! We love bread at our house (especially my toddler!) I don’t have a bread machine, but these would be yummy even without the time-boost of the machine. Thanks for sharing at the mixer, Gabby. Pinned. Thanks, girl! I’m in love with my estate sale bread machine.